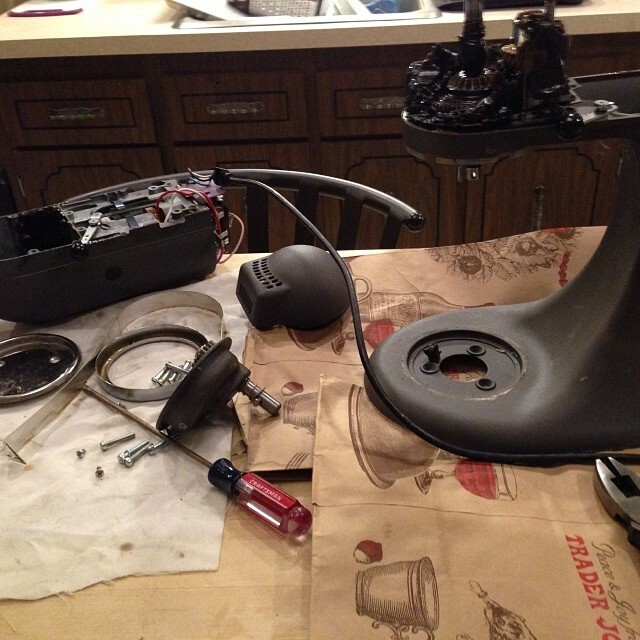 Three or so years ago I brought my stand mixer home. It was a slightly impulsive move, but I was proud and thought it one of the best I’d made in a while. Somewhere I took some very sad pictures of this operation described below, but where they are now…? iPhone only knows…. I had always hoped that the fantastic machines lasted forever perhaps that’s before all small appliances were thought of as “disposable” goods. This guy here has been making a mad thumping noise like its stomping it’s foot, mid-tantrum much like an angry toddler. This tantrum has been picking up just where it left off every time I’ve used it for the past few months. So I’ve used my stand mixer sparingly, which is a difficult change of pace since it’s only been in the last two years that I’ve come to depend on it so much. After a few glasses of wine, and a multitude of YouTube videos about problem mixers – I decided I’d do surgery. It couldn’t get any worse, could it? I hoped not, took the plunge. There aren’t that many screws holding this bad Larry together. None of them were loose, as I first thought. Turns out the latching mechanism is very weak! This thing, hopefully it’s mine and I got a crap one. This thing literally feels like aluminum. Too bendy to be THE THING that holds this head down to mix! I pulled the latch back into a better shape. And put the whole thing back together. Sadly it still stomps violently towards the edge of the countertop every time I use it. The holiday season is a pretty miserable time of year to be out a mixer. It’s also a pretty awful time, amid the gift-giving to find the time and money to scrape together and replace. So now we stare each other down, every time I walk into the kitchen. Occasionally I’ll use it for something that I know won’t be too thick (read: whip cream makes it angry…) to mix, and then realize it’s hopeless and stick it’s cover on it and hide it behind the microwave. Oh no, have you contacted KA, they are very good and stand behind their products. I’m sure they would help you. I did email them via the website a while ago, but got nothing back from them. Now that I’m basically without a stand mixer, I’m going to try even harder to get this sorted. Part of me wants to save up and get myself one of the bowl lifting kinds, cause I feel like it is a little better of a set up than a little pin supporting a very heavy head!